T-Rex. Rendered in World Builder v.1 in 1993. I modelled landscape and put in camera. Placing camera low to the ground helped to create effect of a scary giant carnivor hunting for a prey. Unfortunately big chunks of animataion are missing (Premier couldn't read flc file). Meadow. 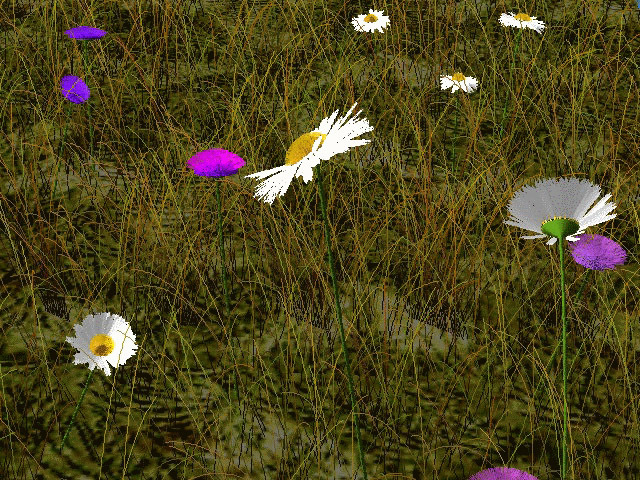 First renderings of L-System based plants and particle system grass. Pine Hill. Another animation from World Builder 1 (1994). Animated grass and pines. Trail. A flight-through rendered in World Builder 1. Windy and Sunny. 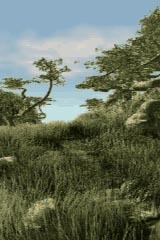 Test rendering of wind in grass and trees. World Builder 1. Windy and not so Sunny. A variation on wind in grass and trees. Procedural wind animation in World Builder.